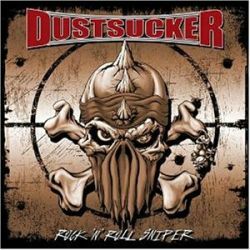 The album title and the skull on the cover let you already guess that Dustsucker are a rock'n'roll band. Indeed listening to the first notes of the opener and title track, you could think that this is a new CD by Motörhead, definitely the Dustsucker's main influence. And it's certainly no surprise that the band's bass player is called Lammy. Although I have so far never heard of this German quartet, they already formed in 1993 and released, before their current album, 3 CDs and 2 EPs. To consider Dustsucker as a simple Motörhead clone would be wrong, but everything that they play has already been played by someone before. The Almighty, Rose Tattoo and Ted Nugent are the first comparisons that come to my mind while listening to Dustsucker. A difference may be that Dustsucker even play dirtier than the aforementioned bands. Nearly all the songs on this record are high-speed punk'n'roll with a touch of metal. One track which differs quite a lot from the rest is Damned Boys, a five minute long raw ballad for bikers and rockers. It's not so bad, but I prefer Dustsucker's straighter songs which directly come to the point and seldom run longer than 3 minutes. Dustsucker will not get a prize for originality, but everyone who thinks that rock'n'roll, sweat and guitars are enough to live will appreciate their work.